Are you passionate about providing value to others? You should be! Help others and they will help you back. Lindsay Adams is an expert on relationship management. He is a master practitioner in Neuro-linguistic programming who focuses on helping people create profitable relationships. He points out that we should establish a relationship to see if we can do business with someone. Lindsay says that we should ‘focus on the other person 100%’ and ‘find some common ground’. ‘Get them talking about themselves’. Listening to other people instead of talking a lot about yourself will make them like you more. Then you can figure out if you can turn the connection into profits too. We should look for our own passion in other people and discover whether they would be good business partners. A simple compliment or a kind act can open many doors. Being genuine is essential. Always be yourself. Would you like to master the art of combining psychology with business? Let our guests guide you. Spread the passion and share it with your friends. Moustafa: Hello everyone and welcome back to Passion Sundays, the best way to end a week and start another! Our guest today is one of the leading experts on helping people build relationships that are profitable – Lindsay Adams! Lindsay, thank you very much for being here with us today! Lindsay: Moustafa, it’s a pleasure! Thank you for having me! Moustafa: I loved having a chat with you yesterday and understanding how you can help people truly connect and then turn that into profit rather than start by ‘How can I be making money from the person that I’m talking to?’. Moustafa: So here’s the question. A lot of time I would personally prefer to be talking to somebody that I share the passion with. So how can I be passionate… let’s say you’re not in the fashion and you want to compliment me on my bowtie but you know there is no true passion connection between the two topics that we are talking about. How can I build a relationship with someone like this? Lindsay: So, it’s really about…the next step in my simple model is a small act of service. So I’m gonna find some way to help you so that we can connect at a deeper level. And, one of the examples that I often give is… I went to a conference. I’m lined up at the buffet, I come to the big pile of plates, I grab the plate, I turn to the guy behind me, I read his name tag and I say ‘Hi, Bill. I’m Lindsay, here’s your plate’ and this appended to me in the US recently. This Bill was so surprised that I gave him the plate. Because most people just take the plate and start putting food on for themselves. And we filled our plates, we went to sat down for lunch, we had the most amazing conversation and he’s now my second best friend for life. I have an open invitation to stay in his house. We literally spend 30 minutes together over lunch. And so… But it was a deep connection opened up by the small act of service. Now, a small act of service could be… Moustafa, I read a great book which I think you love. I could buy a copy of the book and give it to you. Or I find an article online, I send it to you. So find some way to serve the other person or maybe I find another great speaker and I say ‘Moustafa, you need to interview this guy for your show’. So it’s really about tuning in for the other person to find a way to connect with them. So get them talking about themselves, open in some way. The next step is to figure out ‘Can we do business together?’ and this is where we turn relationships into profit. And my next kind of statement would be something like ‘Moustafa, you’re a really interesting guy. We don’t have a lot of time right now. I’d love to catch up with you maybe next week for a cup of coffee or maybe some lunch. And I think we have so much in common that we can probably help each other in business’. Moustafa: But to say a statement like that ‘we have so much in common’ but we might not naturally be on the same passion per se. Lindsay: Sure, so it depends, ok? But the keywords here are ‘I’d like to meet with you, we might be able to help each other in business’. Moustafa: So the help factor, the passion factor. Lindsay: Yeah, yeah. So what is about is again ‘I think we can help each other’ and so I literally want to help you. You know why? Because if I help you, what’s going to happen in return? The law of reciprocity says you will help me. I also have a more spiritual belief and that is if I help people the universe will return that to me anyway. So that’s a kind of a different perspective. Some people don’t get that. It’s ok.
Lindsay: But you know, the relationship thing is so simple, yet so powerful. Moustafa: So all you have to do is basically to be passionate about providing value to others first. Moustafa: And look for your own passion in them. Lindsay: So have you ever had this happen? You meet someone, you shake hands. Nice to meet you. And they say ‘What do you do?’ and you say ‘One of the things I do is I run Passion Sundays and I interview people’ and then they go ‘Oh, you must film that. I actually sell video cameras and we have a very good special on this month’. I met a printer once and he said ‘What do you do?’, I said ‘I speak at conferences, I run training seminars and workshops, I do a little bit of consulting…’. He said ‘you must print training manuals’ and I said ‘I do’ and he launched into a full-on sales pitch. I didn’t even now the guy! Lindsay: So we really go to put our passion for profit onto the back seat until we established the relationship. Lindsay: And we really go on trying to connect. Now I compliment you on your bowtie. When we walked in, I went ‘Hey, mate, nice shoes!’. I genuinely like shoes. I mean, have a look, I’m a shoe guy. And it’s a simple way to make a connection. Lindsay: So it’s then the next step is ‘How do we deepen that connection in a realistic, genuine way?’. If I genuinely don’t like your bowtie, then genuinely I wouldn’t want to talk about it. Moustafa: I understand, ok. So be genuine about what you’re complimenting. Moustafa: Then slowly find a way. If there is a passion that connects, great. If not, just think it’s a good connection after all. Lindsay: And, you know, I think some people when they go to, you know, when they go to a networking, function or somewhere, they are trying to be someone else. You just got to be yourself. Lindsay: You know… And people detect fake really quickly whereas they detect genuine and they like genuine and so, again, it’s really about… Be yourself! I once coached a woman, she was Austrian by birth, very severe, very serious woman. And she said to me ‘Lindsay, you are so funny, you are so quick! Yu are witty, you are sharp. I want you to teach me to be like you!’. And I thought about this for a whole week between coaching sessions and I went back the next week and I said to her, her name is Elizabeth, I said to her: ‘Elizabeth, you can’t be me! You have to be you!’. And I think, there is a message there. We all have to be ourselves and try to find a little bit of something that we like in the other person and focus on that. Some other things that we can talk about – simple things like family. Moustafa, are you married? Do you have children? Lindsay: Oh, you’re engaged. Congratulations! So when is the big day? Moustafa: Coming soon, once I move to Australia. Moustafa: So your passion for the topic back into me… Ok, I understand. Lindsay: And once I saw that you are passionate, then I knew I was one the right track. Moustafa: Obviously, I’m getting married to that lady so I’m definitely in love with her. I’m very passionate about her. But I see what you’ve done. You’ve actually taken that by you being passionate about it, you took it to the next level. Moustafa: So be passionate about the person, regardless of the topic. Lindsay: Yeah, absolutely and show some passion, find that little piece of common ground and then open that up into the wider conversation. And again, get them talking about them. And if it’s more than a one-on-one conversation, you know, include other people. Bring them all in and make them all feel good. You know, I often say when you’re at a networking function act like a host not a guest. Moustafa: Act like a host, not a guest. Actually, I think this is a beautiful takeaway from this episode because in life we act like guests and if we start acting like passionate hosts about life, life becomes ours. Moustafa: Lindsay, this has been a phenomenal way to conclude! Thank you very much for this amazing passion that you’re displaying for our relationships! Moustafa: What do you think? I hope you found this episode as amazing as I did about building passionate relationships. If so please leave your comments on the blog below and share it with your friends. And if you’d like more tools, tips, techniques and exclusive interviews that I only share on my website, go to Moustafa.com. 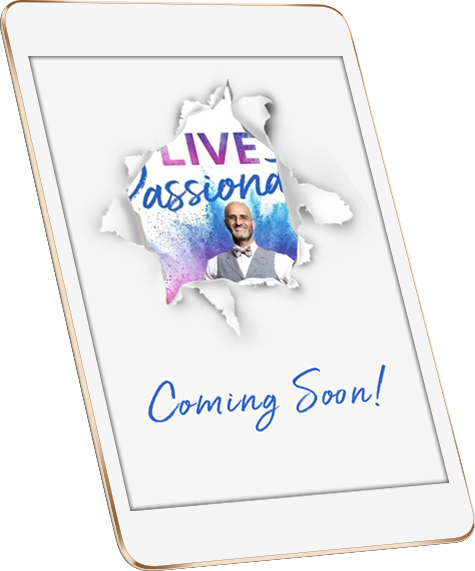 And until the next episode – live passionately!